When renovating or building your own home, rooms and zoning are a big part of your planning. Will you use zoned living to close off each room and give each space more privacy, or will you opt for open-plan living, bringing multiple rooms together and creating the illusion of more space? Our range of stylish, practical internal doors, paired with our clever door systems, mean you don’t have to choose between the two. Why not utilise the advantages that come with both zoned and open-plan living? In the past, homes have traditionally been built to have separate rooms, a popular choice among families and share houses. One of the main attractions of zoned living is privacy, hence why the design is popular among young adults. The ability to close off an entire room also means you can personalise each space, without having to worry about keeping it on-theme with the rest of the home. A young boy’s bedroom can be blue and filled with toys, a teenage girl can pick her own colour scheme and style her room how she wants, the living room can be a cosy nook. 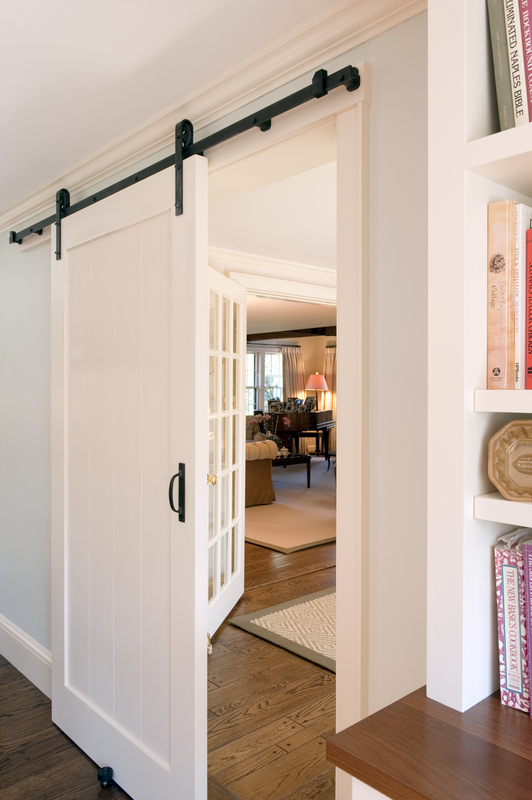 Simply closing the doors to each room shuts off the individual styles and – provided you pick doors that keep within an overall theme – gives the home a complete, tied-together aesthetic. Personalisation also works more effectively in zoned areas because each room is contained to its given space. The smells from cooking in the kitchen, the noise from the playroom and the cool air-conditioning in the living room – all kept within the room itself. This is also great for your wallet, being able to heat/cool one room rather than an open space is much for energy efficient. Open-plan living is increasing in popularity as properties decrease in size. A great benefit of this style is its ability to create the illusion of more space, so it’s very popular among those in smaller flats/apartments and those living in the city (where a decent-sized home can sometimes be out of your price range!). Open-plan living is also great for entertaining – it makes the whole venue feel more connected, so even larger parties can still feel like a friendly gathering. Styling can also have a big impact on open spaces. Unlike zoned homes, the rooms within the open-plan area generally need to complement each other. While a closed-off kitchen can have a totally different colour scheme to a zoned living room, open-plan homes don’t have this option. Although, if you do pick the right stylings, the whole room can look much more spacious and complete! Homes with natural lighting can utilise this feature to fill multiple spaces with warmth and light (while zoned homes need windows in each room). What if you want to use both open-plan and zoned living in your home? The answer: doors! Here at Hume, we offer a range of products to fit every space and both design options. For zoned rooms, we offer everything from the simple Accent range to the modern Joinery Internal doors. Shut off your rooms with products from one of our many ranges to keep within your home’s theme and create a sense of consistency throughout. In terms of opening up your zoned home, but not as far as to implement open-plan living, you can pick from our clever door systems and customisable options. Our newest product, the Frontier Barn Doors, and our popular space-saver, the Evolution cavity units, both allow you to break up two rooms, when you need more privacy, while giving you the option of simply sliding the door back open to create a more holistic space. Our Bi-fold and Multi-fold doors give you a similar option. They use a wider doorway than most traditional internal doors, which means when the doors are opened, there’s a much more spacious, open-plan feel. We have plenty of DIY resources online to guide you through the installation process, so you can save money on hired help too! Plus, Hume Doors are customisable so you can make them work for you! If one of the rooms you’re connecting is quite dark, you can pick a door that has glass inserts – this way, even when the zones are separated by a closed door, you still have that natural light flowing to both rooms. If you have a smaller space to work with, you can pick an option that isn’t quite as wide. You also have a range of textures, materials and colours to pick from when deciding which product will fit the space best. No matter if you’re building a new house or renovating your existing home, you should consider how zoned and open-plan living will impact the space. Consider all your options and (most importantly!) understand the huge difference a simple door can make. If you have any questions about our products, or what our doors can do for your home, get in touch with our friendly team today!